F-Keys are a professional Microsoft Office Training providor who works in partnership with other Technical IT Support businesses in providing added value to thier existing services. If you provide Technical IT Support services to clients and businesses and would like to add professional Microsoft Office Training by registered Microsoft Certified Trainers as an added value to your current services, then call our team on 01634 512345. 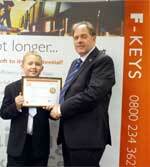 F-Keys have yet another young Microsoft Office Specialist to their credit - Jack G aged just 14 passed his PowerPoint 2010 exam on the 3rd November 2012. It has taken Jack just 6 weeks of self study with some mentoring and support from F-Keys to raise his initial knowledge of the application to being able to sit and pass the worldwide certification. Following our success with a number organisations within the legal & law profession, the team at F-Keys have designed and developed a number of courses specifically for the legal organisations and professionals. Topics include legal multi-level numbering, blacklining, endnotes & footnotes, using field codes and more. Courses are modular based, allowing actual content to be flexible to the specific needs of staff and organisations and able to be delivered as a full day or by half day sessions. F-Keys are planning to run a short series of Microsoft Office 2016 training webinars, and will be inviting some subscription members to join them and provide feedback. If you would like to be included then please feel free to join our mailing list by completing the form on the right hand side of the web page. In association with a number of local businesses and trainers F-Keys will be announcing some courses aimed at the small to medium business owner. These courses include an introduction to video production and marketing by i54NewMedia who will assist attendees to create a short promotional video, that will be edited and finalised by i54NewMedia. Another course will be run by Nigel Grant Training Ltd on how to write clear business English for those flyer's, proposals and other various documents we truly would like people to read and understand. Do you have a course idea and need help in getting off the ground then please contact Alex Waterton on T: 01634 512345 to see if the F-Keys support group can help you. F-Keys are pleased to announce that its youngest ever student Jack Gregory (from Gillingham Kent) has successfully undertaken and passed the Microsoft Office Specialist 2010 - PowerPoint examination. Jack decided to commence studying for his Microsoft Office Special in order to follow in his mothers footsteps as a Microsoft Office Specialist Instructor. Jack is currently studying for his Microsoft Office Specialist Word 2010 qualification.